For those of you with a 4K TV who want to get the best out of it sooner rather than later, one of the ways to do so is to shoot your own 4K videos. It's possible to shoot such video with many new digital still cameras, and if you already own a capable model, then Panasonic's HC-WX970M camcorder won't hold much appeal. This camcorder is for those of you who have a need for a dedicated video camera with 4K capturing. An 8-megapixel, backside illuminated (BSI) sensor is installed, and it sits behind a 30-626mm, 20x optical zoom lens, which has an aperture that goes from f/1.8 at the wide angle, to f/3.6 at the tele-zoom angle. It can record 4K video (3840x2160) at 25p, while Full HD (1920x1080) can be done at up to 50p. These capabilities are packed into a typical camcorder form factor that has a weight of just 403g. If you're not accustomed to handling a camcorder, then the form factor might take some getting used to, especially when it comes to using a mixture of on-screen and physical controls to change settings and manipulate the camera. All things considered, though, it's quite an intuitive camera that shouldn't take more than a few goes to understand. We made use of its Intelligent Auto Plus (IA+) mode for our 4K video shooting, which goes a bit further than standard IA mode by adding further adjustments to colour and brightness, but there is scope to use distinct scene modes, as well as a manual mode. Some features don't work with 4K, such as its HDR mode and slow motion. A dial at the front of the camera allows you to cycle through manual settings, as well as use manual focus (with focus peaking). In an outdoor setting, the 3in screen can be a little hard to view unless it's shaded from bright light, but its viewing angles are wide, so you can see the screen in good colour from different heights and sides. What you'll also notice is a little camera that's built in to the side of the 3in LCD screen. This is a secondary camera that allows you to record yourself while you're recording a scene. It's a feature that hints at the main target market for this camcorder: families. If you plan on taking a vacation and want to shoot plentiful 4K videos while keeping everyone (including the camera operator) in the picture at the same time, then it will come in useful. However, it is a feature that reeks of tackiness, especially when you see the picture-in-picture result on the big screen. Furthermore, it can be distracting to keep tabs on what you are recording on the little camera while at the same time shooting a main scene. Sometimes, shooting just one video source can require all of your concentration, let alone having to keep an eye on a second source at the same time. We took this camcorder out for a spin along Sydney harbour's shores to get a feel for what it can do as a 4K shooter. For the most part, it's decent, but the one thing we came away with was a sense that it shouldn't be used for a lot of handheld shooting. We recommend sitting the camcorder on a tripod for 4K shooting, and using clever framing to capture your scene, rather than moving the camera to take it all in. Recording 4K footage while walking returned results with choppy video, and even slow, sweeping panoramas weren't all that easy on the eyes. 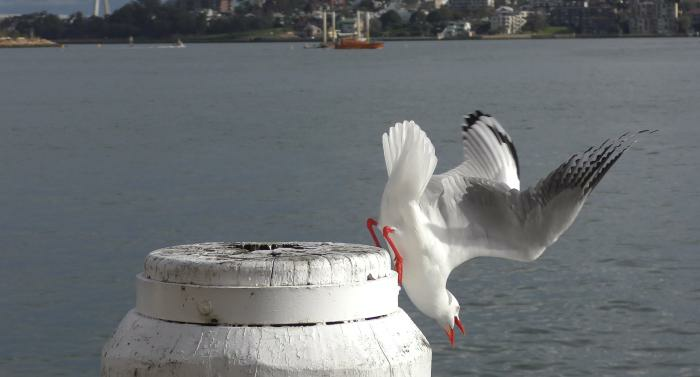 The optical image stabilisation that's built in to the camera worked well during maximum zoom functions. We performed handheld, maximum zoom shots that looked mostly steady, but again, we recommend a tripod where possible. Scenes shot while the camera sat on a tripod were captured with a crispness that put all of the pixels in our Panasonic Viera CX700 4K test TV to good use. There was some noise in areas of solid colours, and some blotchiness was evident in scenes where we used the maximum zoom, but these weren't problematic unless we sat too close to the TV. Exposures were calculated quite as well as expected by the camera. We did notice some chromatic aberration along well-lit straight edges in some of our scenes. The last two videos were handheld, while the first two were shot on a tripod. We will note that the CX700 TV had its contrast set to 100 per cent by default, and this caused bright areas of our videos to look over-exposed. It pays to check the contrast setting in your TV when you plug in this camcorder to view your footage. On the Panasonic TV, it's easy to use the TV's remote to select and play the videos from the camcorder directly (the camcorder ships with a micro-HDMI to HDMI cable). If you want to edit the 4K videos you've shot, you'll need to transfer them off the SD card to a fast computer (one based on a fourth generation Intel Core CPU is best). You'll need to procure your own editing software. One of the other benefits of shooting 4K video (besides make use of the native resolution of your 4K TV) is that you can extract higher quality still images from 4K footage compared to Full HD. Below is an example of a frame that we wanted to keep. 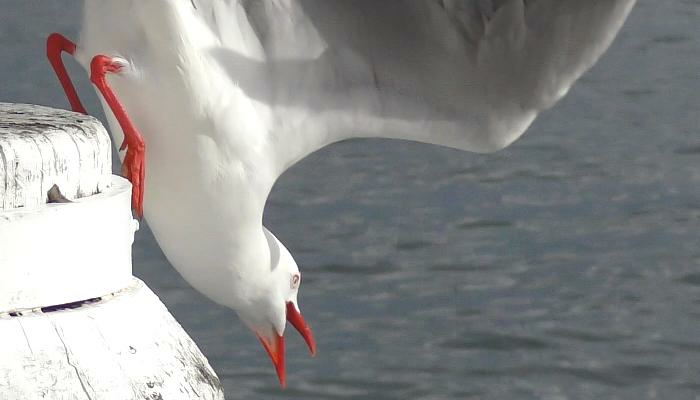 A still image taken from the seagull video we showed earlier. A closer look at the above still. It's hard to recommend a camcorder when so many still cameras can shoot video so capably these days, but if you're after a dedicated video device with a big zoom that can do 4K, then it could be worth it to you. Remember, though, that you do need a 4K TV or a 4K monitor to view the video in all its glory.